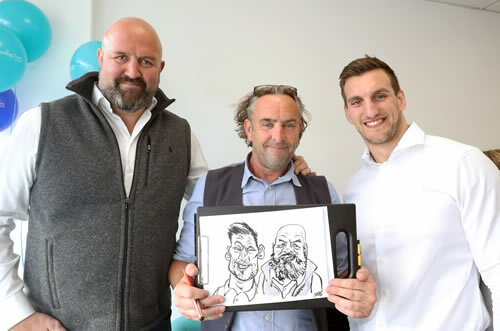 Caricaturist South Wales – Weddings, parties and functions across South Wales. Gregg is a caricaturist in South Wales who has been entertaining with his live drawings for 20 plus years now, his quick draw and amazing likenesses never cease to render his subjects wowed and bedazzled at his caricature drawing talent. Gregg will entertain your guests at any given event with his quick draw technique,he usually entertains for 3 hours, in which time he can capture up to 40 caricature portraits. these are presented to the subjects on completion ( 4-5 mins ), your guests will be totally amused on the day, and will have a personal memento of the occasion to take home with them. Some of Gregg’s clients over the years have included NME, Virgin and Coca Cola to name but a few.